Automate your email and webhook workflow. Automate your business processes with message triggers. Parse and extract meaningful information. Share or integrate the extracted information with other business. Message - Your receive email message or webhook events. Parser - We parse and extract your data. First Name, Last Name, Street address, email address, etc. Action - Send a tweet, add a contact, send a email, send a webhook to any url, download your data. 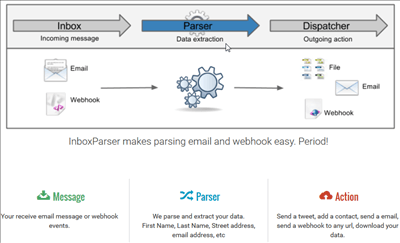 Inbox Parser your incoming and outgoing webhooks. Receive real time notifications and alerts from other systems whenever an automated event occurs. Also, issue a webhook call to a server with a list of key variables and all transaction details. Response Mailer auto responder and follow-up responder is convenient and saves you time by automatically replying to your email and sending out follow up emails instead of you having to manually keep track of it. Response Mailer send emails to your customers and manages prospect email marketing campaigns. Keep your child safe while browsing the internet!